Despite the sun shining brightly outside (this was yesterday), the air is bitterly cold. I don't know about you but I want to bring out all of my spring dresses already, yet I know we have a good couple of weeks ahead of uncertain weather *sigh*. With this in mind, and even though the clock change technically means it is spring already, there are a couple of trends which were huge during fall but we are not yet ready to let them go. Good news is that you can keep wearing them well into Spring as some trends are proving to stick around for the sunnier months ahead! Let's look at these trends, which I may have mentioned before already (and I will be sure to link other posts to this). I've tried putting them all in one outfit and I hope you like it! It hasn't been that long at all since I've spoken about how hot tailoring was and will continue to be this season. 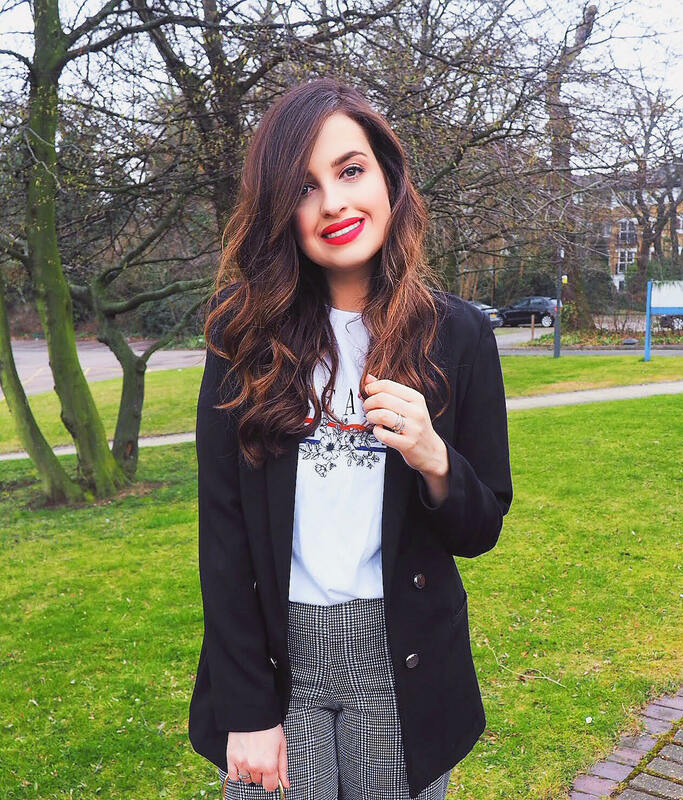 To say that I have been obsessed with all sorts of blazers is an understatement, especially this black one which I also wore here (check out my post on How Would You Wear The Tailoring Trend?). For fall, we took tailoring and made it a very essential layer to beat the cold. This spring, a blazer will be the only layer you need on top of a tee or a cami. It instantly makes the look more elegant, and it is so versatile meaning you can either dress it up or down. A black blazer is an essential piece when building a capsule wardrobe that works all year round. For spring, however, if you want to inject some much-needed colour into your outfits, the baby pink blazer trend is also going to be hot hot hot! These aren't going anywhere anytime soon. My Would You Pay £300+ For A Designer T-shirt? post was a bit hit and thankfully, you don't need to pay that much for a t-shirt, given the high street has very well caught up on the trend. T-shirts with phrases and slogans scream spring and summer, and let's be honest, is there anything more comfy than throwing a pair of jeans and a tee on? I think not. I took a well-deserved trip to Primark over the weekend and I was so surprised to see how huge their t-shirt range was this season. Needless to say, I have stocked up on them and I may or may not have gone a little crazy with their Disney themed ones. Blazers, coats, hats, you name it. Everything was in the Prince of Wales print during fall (see my post on The Check Blazer Trend & How To Style It) and despite it sticking around for spring, this has come in a checked print form instead. The pants I am styling here are a great example of this trend refresh. Not only is the wide leg cut particularly fashionable at the minute, I love how I will be able to pair it with boots as well as trainers for those more casual days; talk about being versatile! I'm not ready to let go of red just yet. This Primark bag seems to be very loved amongst bloggers and chances are you have already seen it all over your Instagram feed and here on the blog (here). Not only it comes in this striking red colour (also available in black and white), the ring detail is very trendy. Red adds colour to an otherwise boring outfit, it makes everything more interesting and draws attention to it. To create harmony in this look, I matched the bag colour with a nice red lippie and I think it makes the whole difference, don't you? What do you think? Will you be wearing these trends for spring as well? Thanks for reading beauties and enjoy the short week ahead! Precioso conjunto, los pantalones me encantan y como los has combinado. Un besazo. Slogan tees are a must spring outfit. I love everything on the list. Thank you! I agree, loving a good tee at the moment! That pants and the blazer looks so stylish! At first I wasnt too sure but I agree, it looks great! This is a wonderful style Pam, you look stunning. I love your bag and the lip color <3 Have a wonderful day dear! thank you lovely! A red lippie is a must! Slogan tees and checked prints are my favorites! You look so stylish, love this outfit! I feel like these things will always be in style because they are classics. I love the blazer trend for sure. Exactly! These are worthy of a capsule wardrobe! I adore anything red so you got my attention there! I also love graphic tees! Me too! Obsessed with red at the minute! YAS! A bit of red definitely makes everything pop! Woooo! :) Matalan is great for blazers! They all sound like great trends to be sticking around! Blazers are so easy to wear!! Agreed, obsessed with blazers at the minute! Your styling sense is great.. Love the jacket.. Such a chic and edgy outfit dear! Love the coat and plaid pants combo. Your matching red lipstick and bag is so pretty too! Such a beautiful accent. I love how the lipstick matches the bag. Slogan tees are so cool and I love them too. I am thank you! Was on holiday for 2 weeks but now I am BACK! I read the whole post nodding in agreement, all of my fave trends are staying in for the spring too what more can I ask for haha?! And what a stunning outfit, love how the checkered pants give such a vintage look to the outfit!\Hope you're having an amazing week! Ah this is such a gorgeous look - your look beautiful and I actually really like pops of red in the winter and summer - it's such an elegant colour and brings a look together! Red is my colour at the moment haha! How Would You Wear The Tailoring Trend?